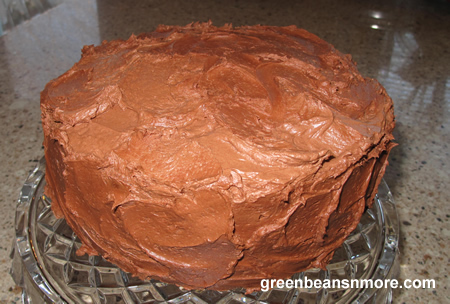 My husband's favorite cake is a yellow cake with chocolate frosting, it's the only type of cake wants on his birthday. Since I like to make a cake from scratch I've been searching for the perfect recipe for yellow cake for years. After baking lots and lots of different cake recipes I think I finally found the best homemade yellow cake recipe. 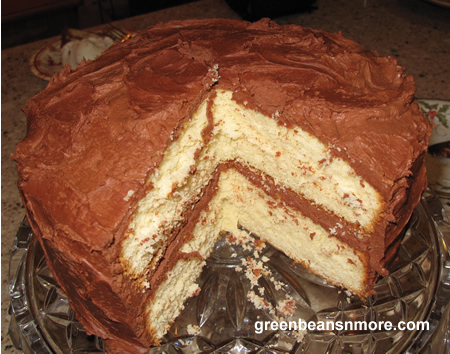 The perfect moist yellow cake recipe is this one from Eve's Restaurant in Arlington. It was featured in the Washington Post in April 2006. It's very moist and close to a pound cake in texture. I top it off with a rich Chocolate Buttercream Icing Recipe from Cook's Illustrated. Preheat the oven to 350 degrees. Lightly grease and flour two 9-inch cake pans and line the bottoms with parchment paper. Melt butter and let it cool to room temperature. Combine the sugar, flour, baking powder and salt in the large bowl of a stand mixer. (A stand mixer is preferable for this recipe, though a hand-held electric mixer may be used). On medium speed, add the butter, incorporating in several additions. Beat for about 2 minutes, or until combined; the texture should resemble cornmeal. In a separate bowl, combine the eggs, vanilla extract and milk. Add to the flour-butter mixture in two batches (scraping the bowl once), and beat on medium speed for 2 minutes, or until smooth. Distribute the batter evenly between the two prepared pans. Bake for 35 minutes, or until a toothpick inserted into the middle of the cake comes out clean. Transfer to a wire rack and cool for 20 minutes. Remove cakes from pans to cool completely. Frost the cake. It can stand at room temperature for 1 hour; otherwise, cover and refrigerate until ready to serve. Cook's Tips: This is a wonderfully buttery cake with a pound cake like texture. It's a matter of preference, but, I think this cake is best served at room temperature. The fat has a better mouth feel and the flavor is more enhanced at room temperature.